In the course of your career, you will have written, read and replied scores of emails. So, it is essential that we understand the fundamentals of business email writing. As I mentioned in an earlier blog, if you want your email or message to be read, your subject line should draw the reader’s attention. Pitch Meeting - (name of client) - 10 a.m., (date) makes better sense than Meeting or Pitch. You want the recipient of your email to understand your message, and understand it fast. You don’t want to confuse the reader, so keep your writing simple and fuss-free. Avoid long sentences and use simple English. Also, keep the context relevant or your mail is likely to go unread. No one likes brusque or abrasive emails. 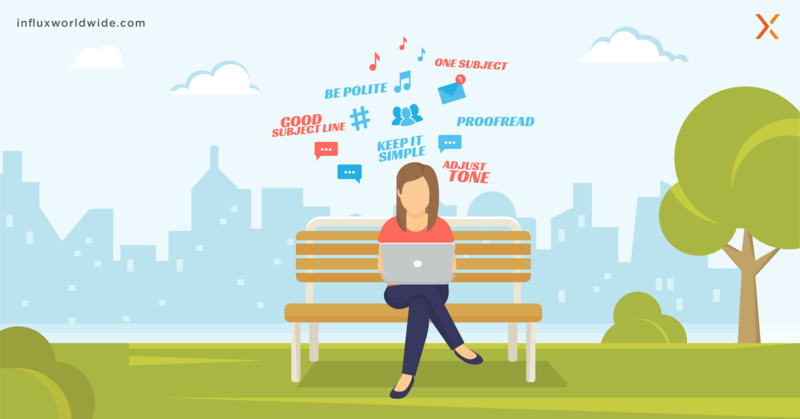 Your manners will show up in your email, so it won’t hurt you to be polite. You are more likely to get a positive response from your reader if your tone is positive. While you might think you are just being honest and straightforward, a little tact can go a long way in getting people to work with you than against you. Discretion is the better part of valour. Express yourself the way you would like others to express themselves to you. “That’s a terrible idea; what’s the matter with you! ?” OR “I don’t think that will work. Could you come up with some other options? Do not write about too many things in one mail. It is always better to address just one issue in one email, rather than clubbing several different issues together. When your email talks about many different points, it is likely to lose its purpose and confuse the reader, who will likely ignore your message altogether. If you think your email will run long, write in bullets so that your reader can get the message even at a glance. You really will avoid trouble if you spare a few seconds to read what you have written and check the spellings and facts. If you have written that your email has an attachment, please check if you have attached it. Quite often, we receive an email that says, “PFA …” but has nothing attached. It is not only annoying but also shows you up as careless. Also, be aware of where your recipient may be located and consider the cultural differences. When in doubt, research and find out. I would also advise you to leave out exclamation marks/points in business emails. There are some matters that are always safer to discuss face to face. Don’t share personal information in an official email. And, if you have to deliver bad news, try and do so in person — it’s wiser and kinder. Do not fill in the email address of the recipient until you have written your email, proofed and edited it and checked everything else. Too often have we hit a wrong key and watched with dismay as a half-written/badly-written email flies off our laptops or phones. Since this cannot happen if the To: box is blank, leave it empty till the end. And, for similar reasons, think twice before clicking on “Reply All”. Do not write when you are angry or upset. Think about what you want to write. Sometimes, it does help to pen down your thoughts and let off steam at a client or colleague you are annoyed with, but do not send the email unless till you have calmed down. Bear these tips in mind when writing your future emails and I am certain you will not go wrong. Ping us if ever they do!